When working with heavy-duty wheel acids, professional detailers use Tolco Gold Standard Acid Resistant Sprayers. Pay attention to professional detailers: they 're using the tools and accessories they are because they work better than anything else. These upgraded acid-resistant sprayer bottles use an ergonomic handle, extra large sprayer trigger, and chemical-resistant Viton o-ring seals to keep up with the fastest detailers on the planet. Every pull from the extra-large sprayer handle pumps out 1.3 ml per stroke, over 40% more than stock sprayer heads. If you need to cover a large area with your detailing potion in a hurry, this sprayer head is up to the task. Viton seals resist the toughest detailing chemicals and keep them in their place: inside the bottle and all over filthy messes only! Professionals can 't be stopped while on the job, and pausing to refill the bottle with detailing chemicals is not an option while out on a jobsite. The extra-large 32 ounce sprayer bottle capacity is double that of stock bottles and sprayers. This extra space gives you the juice you need to take on, and finish any marathon detailing job. Graphics posted onto the bottle outline a built-in dilution ratio chart. Now you can mix and blend your own custom-strength detailing chemical for the perfect cleaning touch on any mess inside, or outside the vehicle. Professionals choose tools that perform, last, and serve multiple functions. Chemical Guys Heavy Duty Bottles & Sprayers tick all the boxes, and will simply outperform and outlast any sprayer bottle you 're using now. Give it a try, then try not to upgrade ALL of your detailing bottles on your next parts order! What 's easier: squeezing a sprayer handle 10 times or 100 times to get the job done? The Gold Standard Acid Resistant Sprayer And Bottle from Chemical Guys makes life easier by doing more work for you. Every pull of the sprayer trigger pumps out over 40% more product than comparable sprayer heads fitted to detailing products. 1.3 ml per spray may not sound like much, but image pumping out 40% less with every squeeze of your fingers. That gets tiring! Fast. Professional detailers save time, save strain, and save money by choosing better tools, and the Gold Standard Acid Resistant Bottle & Sprayer is a better tool for detailing your car. Pick up the upgraded sprayer and feel the molded plastic handle and the easy pull of the extra large trigger. Being comfortable while you work adds up to a better quality of life, and the easy to grip and use Heavy Duty Gold Standard Bottle & Sprayer contributes to a lifetime of stress-free work and detailing. 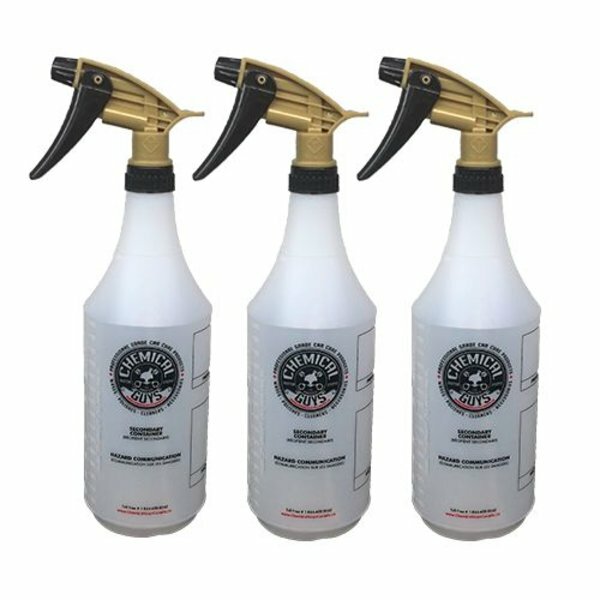 Upgrade your stock detailing bottles to these Heavy Duty Gold Standard Bottles & Sprayers, and see why professionals all use these bottles for every detailing job. The most heavy duty wheel cleaners use stronger acids to cut through intense stuck-on brake dust and road grime. Chemical Guys Gold Standard Acid Resistant Heavy Duty Bottle & Sprayers are upgraded for superior acid resistance use Viton seals in place of traditional rubber O-rings and gaskets. Viton is perfect for use in these heavy duty sprayers because of its superior resistance to stronger acids and bases. Viton is used throughout fuel, oil, and blending systems in the automotive, aerospace, and production industries. All the vital seals and O-rings in the Gold Standard Duty Bottle & Sprayer are made with Viton for superior resistance to the heavy duty wheel cleaners and detailing chemicals that professionals use every day. Fill the Gold Standard Heavy Duty Bottle & Sprayer with any Chemical Guys wheel cleaner, degreaser, window cleaner, APC, detail spray, air freshener, or waterless wash solution with no fear of damage or leaking from the bottle or sprayer head. Take the Gold Standard Heavy Duty Bottle & Sprayer on any detailing job for superior performance and proven reliability with any detailing product. Another trait professionals value in the tools they choose is versatility. If one product can do many jobs well, it is usually a better investment than one that cannot. The Gold Standard Acid Resistant Bottle & Sprayer is fully-adjustable and can be set up for type of detailing, cleaning, or sanitation job in, around, and outside the car, home, office, and garden. Spray a fine mist of waterless car wash or quick detail spray for maximum coverage with minimum product. Focus the sprayer beam to clean inaccessible wheel and engine bay parts, or water hard to reach potted plants up on a shelf. The Gold Standard Bottle & Sprayer also features a printed label with dilution ratio instructions and measures right on the bottle. Now you can mix, blend, and dilute your own custom brew of detailing chemicals to suit any cleaning need, heavy duty or lightweight. The possibilities are practically endless! Don 't change your detailing techniques and jobs to suit your tools: choose the tools that perform where and how you need them. Choose Chemical Guys Gold Standard Heavy Duty Bottle & Sprayers, and take on any detailing job anywhere, any time.